HRP student researcher Rohit Makol ’20 (ENG), seated, works with David Martinelli, assistant professor of neuroscience at UConn Health, during summer 2017. The Health Research Program offers a pathway into undergraduate research for students with interests in health and the biomedical sciences. 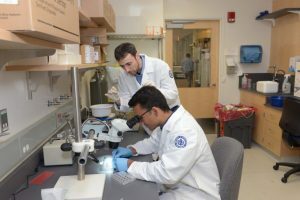 By facilitating connections between UConn Health researchers and UConn undergraduates, this program will involve more students in the cutting-edge research at the Farmington campus. The Health Research Program includes a combination of academic year and summer research opportunities, offering undergraduates and their faculty mentors a structure for sustained engagement in research projects, maximizing student learning and preparation for graduate study and/or careers in the health professions. Be a full-time student in good standing at a UConn campus during the Spring 2019 semester. Be willing to continue their research involvement for Fall 2019 and Spring 2020. Beyond these general eligibility criteria, each individual opportunity description specifies the desired qualifications for that position. The deadline to apply for Summer 2019 Health Research Program opportunities is 11:59pm on Monday, February 4, 2019. We expect that faculty will interview their leading candidates between February 5 and February 20, and offers will be made in late February 2019. Research opportunity descriptions and application links are accessible in the Summer 2019 Research Opportunities section of this page. Each opportunity has its own description and application link. If you wish to apply for more than one opportunity, you must tailor your application materials to each opportunity’s requirements and submit an application to each opportunity that interests you. Please note that if you apply to more than one opportunity, OUR will send you a follow-up form in which you will rank those opportunities in order of preference. For guidance on how to use the application management system, please review the Quest Portal User Tips. Students participating in the summer 2019 program will receive a $4,000 stipend for a commitment of 360 hours of summer research (10 full-time weeks). Students may receive a maximum of one summer stipend over the course of their participation in the Health Research Program. Academic year student researchers (continuing research for fall & spring) may be eligible to apply for a $1,000 winter research stipend if they commit to completing 90 hours of winter break research. A time commitment of 360 hours (typically 10 full-time weeks) is expected for student researchers during the summer. Summer researchers will receive a stipend of $4,000 to cover the expenses associated with participating in this program (e.g., summer rent, meals, parking, etc.). The names of participating faculty and a brief description of the research opportunities they are sponsoring are listed in the table below. Click on the relevant link in the right column to view more detail about the opportunity and access its application. Neuroscience The cornea is the transparent tissue in the front of the eye, and its main function is to refract light. Injury/insult and diseases compromise corneal clarity, cause fibrosis and scarring, and ultimately blindness (4th leading cause of worldwide blindness). Neuroscience Project 1: In this project we will investigate a novel drug target “Purinergic receptor P2X4” for therapeutic exploitation in stroke. The overall goal of this project is to determine if modulation of P2X4R signaling in myeloid cells is a viable therapy for stroke, working towards our long-term goal of developing and identifying target-based therapies for stroke. 1. To design, synthesize and evaluate new fluorescent molecular probes that specifically label phosphotyrosines in cells. Perform various imaging assays using the fluorescent probes on model systems, and compare their relative performance. What time commitment is expected of a summer researcher in this program? What time commitment is expected of an academic year researcher in this program? How do I earn academic credit for my participation in this program during the academic year? What transportation options are available for students? Do I need to be pre-med to participate in this program? Do I need to be in Honors? How do these opportunities continue into the academic year? This application asks for a Science GPA. What is that? How do I figure out my Science GPA? A time commitment of 360 hours (typically 10 full-time weeks) is expected for student researchers during the summer. The standard research dates for the program are May 28-August 2, 2019, but you may elect to extend your involvement in research in consultation with your faculty mentor. All weeks of summer research must be completed between May 13 and August 23, 2019. A time commitment of 3-9 hours/week is expected for student researchers during the academic year; this varies across research opportunities and is a key factor to consider as you are reviewing the different opportunities and considering which might be a good fit for you. The standard formula for academic credit is 1 credit for each 3 hours of weekly research, and you will register for the appropriate number of credits given the time commitment you are making to research. Note: In the absence of extenuating circumstances (e.g., leave of absence, study abroad), a student cannot discontinue participation in the HRP during one semester and resume participation in the HRP in the subsequent semester. You will likely earn Undergraduate Research, Independent Study, or a similar kind of course credit in the department associated with your major. The most common arrangement is for a Storrs faculty member to be the instructor of record for the course and to coordinate with the UConn Health faculty member supervising your research in order to approve a learning agreement and enter the appropriate grade at the end of the semester. OUR staff will work with you individually to provide guidance on how to proceed in your specific situation. Shuttle service between Storrs and Farmington is available at no cost to students Monday through Friday. We expect that the summer shuttle schedule would allow you to work in Farmington 9am-4pm (taking the 8am shuttle from Storrs and returning on the 4pm shuttle from Farmington); please note that using this mode of transportation will limit your flexibility. During the academic year, a mid-day shuttle provides some additional research schedule options; transportation via the shuttle during the semester allows Storrs students to conduct research at UConn Health 9am-12pm, 12pm-4pm, or 9am-4pm. Please note that those time windows do not include the time you will spend on the shuttle. With travel time included, the time commitment is 8am-1pm, 11am-5pm, or 8am-5pm, respectively. We encourage you to take your class schedule and the shuttle schedule into consideration when reviewing the possible work schedule associated with each opportunity. You may also elect to use another form of transportation. Please be aware that this program does not offer support for mileage or parking costs as the free shuttle option is available. You do not need to be pre-med or be a member of the Honors Program in order to participate in this program. The program is open to all undergraduate students interested in health research. However, bear in mind that this is a demanding program that requires you to coordinate weekly travel to UConn Health. We encourage you to take a realistic look at your schedule, the demands of your other courses, and your past academic achievement in order to assess whether this program is a good fit for you. OUR advisors would be happy to discuss your specific situation and the most appropriate research opportunities with you at any time. Review our Meet with an OUR Advisor page for more information on how to make an appointment. Sustained engagement in a research project maximizes learning, so we want to make it possible for students to stay engaged in undergraduate research at UConn Health over longer periods of time. The Health Research Program is focused on developing new research opportunities and involving more undergraduate students in research at UConn Health. The program offers a structure for the new student-faculty pairs that are formed in the summer to continue into the academic year. Students selected for summer 2019 opportunities will complete a mid-summer assessment process along with their faculty mentors, which will gauge whether adequate research progress is being made and will ask both student and faculty to indicate their interest in continuing the research placement beyond the summer. Continuing placements will be contingent upon satisfactory student research progress and continued interest by both student and faculty (in addition to the student’s full-time enrollment and good standing at the university). If a student continues his/her research in academic year 2019-20, s/he may be eligible to apply for a $1,000 winter research stipend if s/he commits to completing 90 hours of winter break research (and graduates no earlier than May 2020). While student may continue research in this program across multiple academic years and/or summers, students are eligible for a maximum of one HRP summer stipend. In the absence of extenuating circumstances (e.g., leave of absence, study abroad), a student cannot discontinue participation in the HRP during one semester and resume participation in the HRP in the subsequent semester. Unlike your cumulative GPA, your Science GPA is not automatically calculated and reported on your transcript. You will need to calculate this by entering the number of credits and your earned grade from each of your science classes into a GPA calculator (like this GPA calculator from UConn ACES). We recommend that you move through your transcript methodically, using your best judgment to decide whether a given course is a “science course,” and entering the relevant information into the calculator for each science course. Once all information is entered, click the Calculate button, and report the GPA output in your Health Research Program application.